On this website we have put a copy of our 2018 fixture book. However, from time to time new or revised fixtures become added. For example, Taskers Trophy games, Society visitors etc. 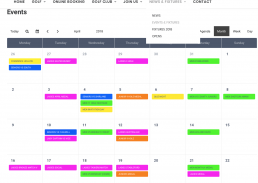 For the most up to date information on whether the course is busy on a particular day you can go to our Events Calendar to check. It’s situated under the ‘News and Fixtures’ banner of the website in the subsection called ‘Events and Fixtures’.